Have you ever pondered how every decision that you made in the past brought you to where you are now? How everything could have been completely different if you had chosen the other path? (Or if it had been chosen for you, as sometimes what happens is out of your control). I didn’t know it back then but, in my case, China appeared on my horizon when I was 17 years old and a Spanish university rejected my application. That university offered the Translation and Interpreting degree, what I wanted to study, and it was the closest to my hometown (3-4 hours by bus). My friend also wanted to go there. In Spain we have a university access test, like the Chinese gaokao, and your mark determines if you can attend the degree/university you want. But this specific college I wanted to go to had its own entrance exam, with a written test and an oral interview. I went to take the test with my friend. We both passed the written exam, and after doing the interviews she was selected, but I was not. According to my mum, I didn’t pass because of the style of the clothes I was wearing (this was the beginning of the noughties and I have to confess I was into low waisted, baggy pants back then). I think I simply didn’t pass because the objective of the interview was to assess my English level and I didn’t talk much. The interviewer asked something about Harry Potter (which to this day I haven’t read/watched) and then had me describe a picture, and I didn’t do too well. So I had to go to a university in another city which was further away. No one from my hometown was studying there. This translation college didn’t have an independent entrance exam, but you needed a very high average mark in the national exam (I think that degree in that university had the highest average mark in the whole of Spain that year; translation was a popular degree back then and there were not many colleges offering it). In my first choice of university (the one with the interview I didn’t pass) there were no Chinese classes. I would have probably studied Japanese, and maybe now I would be in Japan. Or perhaps in Germany, as German always was what I really wanted to study. The university I ended up going to was one of the only three universities in the whole of Spain that offered Chinese classes back in 2002. In one of my first posts four years ago, when I started this blog, I told the story of why I started studying Chinese. The short version of the story is that I didn’t have any prior interest in Chinese or in China but I chose it as an elective because someone told me the professor was very nice. We used to have a “Chinese dinner” every semester in university. 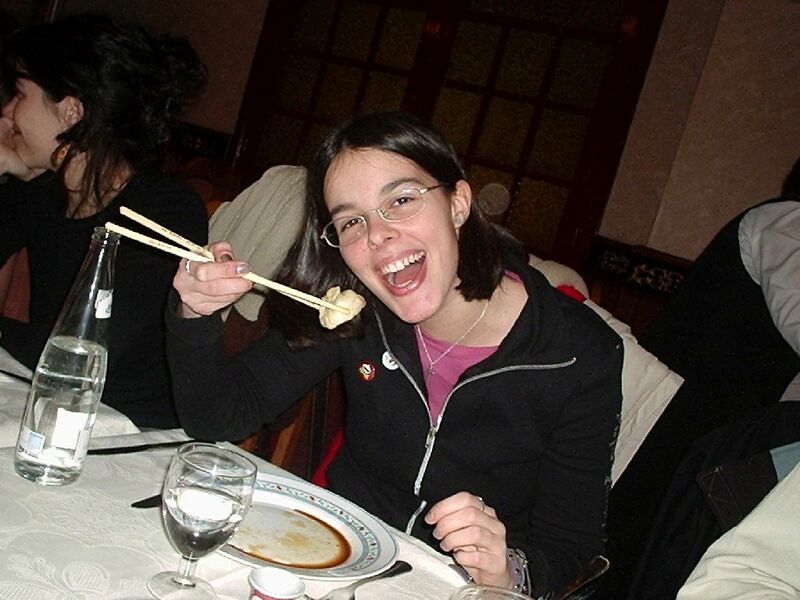 Notice how my chopsticks-grabbing technique was not too good back then. This picture is from January 2005. 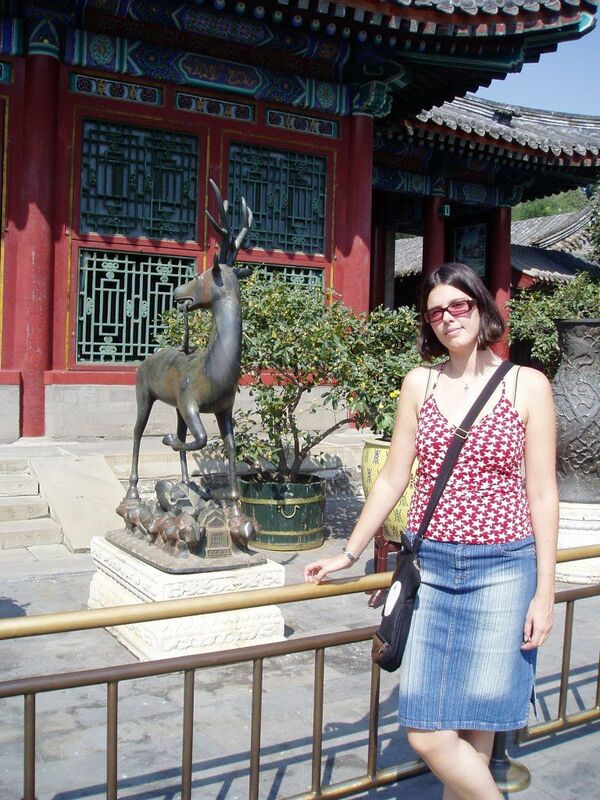 Visiting the Summer Palace at the beginning of my first year in Beijing (September 2006). If I had not gone to that university, I wouldn’t have started learning Chinese. If I had not started learning Chinese, I probably would have never came to China, or maybe just as a traveller. To be honest, when I started studying Chinese, I had no intention whatsoever of going to China. Just the thought of travelling outside of Europe scared me! But a professor encouraged me to go to Beijing to study because in Spain we couldn’t really learn much. If I had not been fluent in Chinese, the Spanish company I started working for in 2011 wouldn’t have hired me, and of course they wouldn’t have sent me to Suzhou. If I had not moved to Suzhou at exactly that point, I wouldn’t have met C., or he wouldn’t have been single. Look at me now! The girl who didn’t have any interest in China has been here for 11 years, is married to a Chinese and is expecting a half Chinese baby. If someone had told me this in 2002, I would have laughed so hard! Picture from our Spanish wedding. Yes, the photographer took us to very weird places. This was going up the tower of the castle. What were the decisions that changed your life? Every decision is changing a part of my life! For example, a tiny one, my decision to read your blog post and responding to it makes me think that I’m too a foreigner in another country counting the blessings of life! Where it leads me I don’t know, but, I do know that your story touches mine on several points! Life can be so unexpected sometimes. But it’s fun to see where it takes you. In my case at least, unexpected is indeed a very appropriate adjective, haha. I think I would have been happy too in other alternative scenarios, haha. But we’ll never know! I found this very interesting and positive. If there had been a reblog button I would have done it. Like you, going to a particular college led me to a different place, which led to meeting my husband. I sometimes think of all the little decisions that led me to where I am today. And when i wish I’d made a less stupid choice, I have to remember that even that idiocy landed me in a pretty good place. It’s nice to read about how you ended up in China, Marta. It seems like destiny led you to there. For a lot of us, China doesn’t work out too well, but I’m glad for you. It’s great following your blog and reading the interesting and insightful posts. And congratulations on your future child. Yes, and also, from your posts, Suzhou seems to be nicer than Beijing. I look forward to your article about that. I can’t stand the guy so I would hate to see him and his name in the papers all the time, but it’s good to point out how vain he is (and how sycophantic the newspapers are). Well, I loved Beijing when I lived there, hehe, but I was young and a student so I don’t know how it is to really live and work there. Suzhou is indeed super nice and people here are in general more polite and civil that in other cities. I rarely get any gawping or “look, a foreigner” here. The air is now better in Beijing than in here though, or so it seems! Suzhou sounds really great. I really can’t say people in Beijing were polite or civil. I heard the air in Beijing is much better but it’s still bad in the surrounding area. 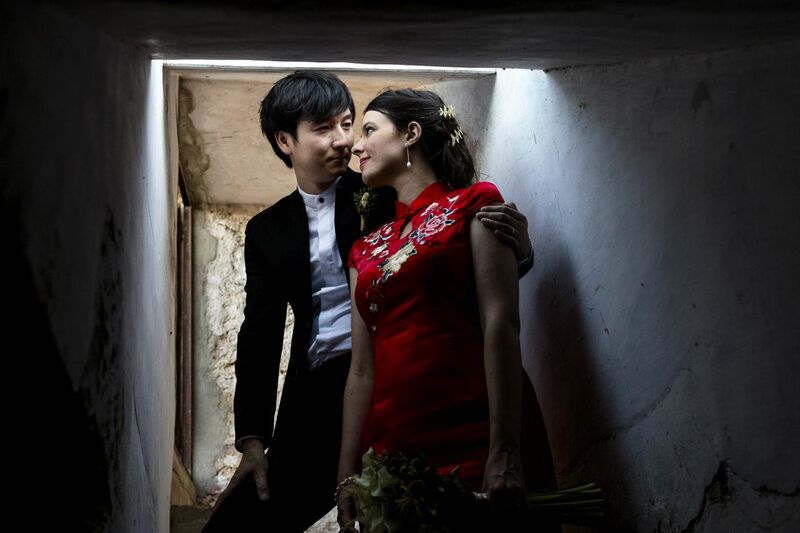 Fabulous story… and I LOVE your wedding Spanish photo! Very special! It is always interesting how “fate” turns out by just looking how you at first failed those exams and everything turned out in another way. Hi! I also think about this from time to time. How the slightest change in a decision, made by you or by others, could change your whole future… In my case, I was working in Madrid, and three months after I was hired the company got some unexpected projects in Morocco. They were supposed to send only men to work there, because they were afraid that women could suffer from sexism, but the men that were proposed for the position rejected it, so the boss offered it to me and I accepted. And that’s how I started the greatest (and hardest) adventure in my life! If someone had ever told me that I would be working all alone in Morocco for a Chinese company, I would have also laughed, and very hard too. I love your story. It’s funny to think of life like that, “If I never…I wouldn’t have ever…” I think my life has had too many plot twists at this point to make heads or tails of it. But you’ve got me wondering if I should travel down that rabbit hole and take another look. I think I’m still in the middle of trying to figure it all out! Well it’s difficult to ascertain how every single thing came to be, but maybe you can track down some big ones! We would like to think we control our lives, but so much is out of our hands. I chose to be an elementary school teacher. Then my husband’s company downsized, he lost his job and found a new one abroad, and I became an expat wife. Never anything I would have expected or chosen. Right! For many expats wives this is still the same; they wouldn’t have chosen it but it just happens. I love your story! And congratulations on your pregnancy! It was also very unexpected for us, we never thought about moving to China but were offered jobs in Shanghai after applying to a school in Switzerland… Little things can change everything! Yes! Switzerland to China… definitely not the same, hahaha! I’m glad destiny led you to China, because you seem so happy and content there. You’re going to have a Chinese family! It’s weird how just one, tiny decision can impact your entire life. I also like to think that, without China, I wouldn’t have met my husband either. I actually like that wedding shot. Learning Chinese as an adult would have been tough. My best wishes for a comfortable pregnancy. When are you due? Thank you! I also like that picture, although the background is meh. The due date is August 27. Wonderful how everything worked out so well for you. I was doing immersion language training in Beijing and applied for promotion back home in Canberra – if I didn’t apply for that job [which I got], I would not have been selected at that level to represent my organisation in China for three years AND if I had not been studying Chinese I probably would not have been selected either. I think I wouldn’t have gotten any of my two “real jobs” if I didn’t know Chinese! Even though for the current one it is not really necessary. Now I have a long-distance relationship with a guy that lives in Suzhou, I’m Brazilian and I’ve met him 6 months ago on a language exchange website and then started to get to know each other even more on Skype. He’s a simple worker, I’m an undergraduate, we’re 10 years apart in age. We found out that our love for each other is really strong but now I feel utterly confused. Sincerely I want to be with him but how is it possible? Since I have to turn 20 in order to marry in China, still applying for scholarships in there . How could we make a life together? :P many doubts. Your blog is a fresh breath of air to me. I think the easiest way is what you are doing, apply for scholarships so you can come and study Chinese here. There’s the CSC scholarship and the Confucious Institute one that I know of. I would suggest to live together for a while before getting married, there’s no need to be in a hurry! Ay marta me emocionó este post… yo también he pensado esto varias veces, “what if…”…. y como todo podría haber cambiado en base a un sólo cambio en la cadena de decisiones que hemos tomado…!